These robots have a primary directive...to bring fun to your room! 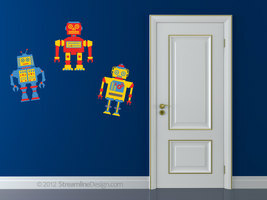 Robots are 12 to 13 inches tall and printed on high quality removable and reusable wall fabric. Easy to install. 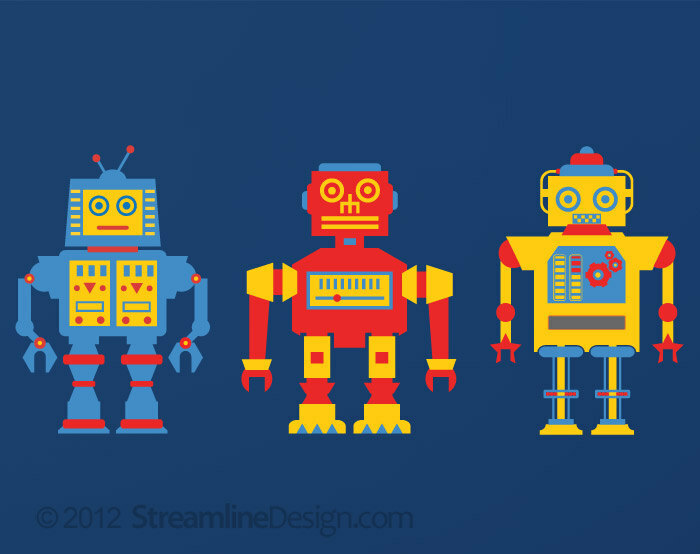 They will arrive with a masking layer for initial application. Simply follow the instructions included with your order. They can be carefully removed and reused again later if desired. Be sure to keep the backing paper for storage should you want to remove them and use them elsewhere at a later time. Note: Our high quality printed removable wall fabric won't harm the surface or leave a glue residue and won't peel paint on properly prepped, primed and painted surfaces.